It is such a pleasure to introduce my guest on Behind the Blog today. When I first stumbled across Things That Inspire, I was immediately drawn to the incredible detail and engaging features. Each post, filled with endless images and stories that articulate beautiful design concepts, ideas and trends. More recently, interviews with designers, architects and furniture makers. It's one of my favorite reads, as well as a fabulous design resource. So without further ado, here is Holly, the insightful author behind the blog, Things That Inspire. What was your earliest experience in art/design/architecture? I have always loved art, and as a child lived in Washington DC, a city that has amazing art. My father would take my sister and me to the Smithsonian, the National Air and Space Museum, and the National Gallery of Art virtually every weekend. 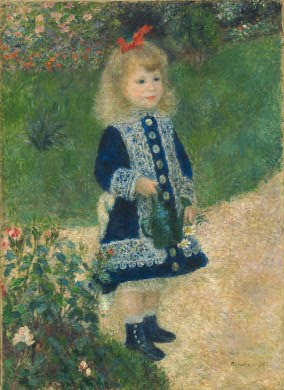 I still remember the feeling of awe that I experienced looking at Renoir's 'Girl with the Watering Can' (it is no coicidence that this is my profile picture!). I used to draw and sketch all of the time as a child, and now that I stay at home with my children, I have been able to squeeze in art classes here and there. I have taken painting classes, calligraphy classes, encaustic and abstract art classes, and am now taking a figure sculpture class. Working in 3D has been a whole new experience, and has really helped refined my sense of scale and proportion. As far as design and architecture are concerned, I have always loved houses. I remember going to a friend's house in the late 70s, and feeling a huge sense of appreciation for how they had decorated their powder room. I also remember going to Newport, Rhode Island as a teenager and feeling a sense of awe and fascination with the beautiful architecture that abounds in the town. On the interior, I tend to see interiors as living still life, in a way. 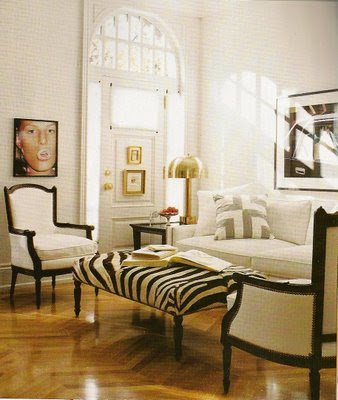 A well done, beautifully composed room is a form of art in itself, with the balance of color, form, scale, and texture. I love to write, and it has always come naturally to me. I was an English major in college, so I got really burned out from writing for many years - I wrote thousands of pages for my exams and my papers in college. After a 15 year break from any major writing, I felt the urge to start writing again. When I first stumbled upon design blogs (like many others, Style Court was one of the first blogs I found), it seemed like a natural outlet for me. As I am also a visual person, and already had literally thousands of pictures on my computer in my 'inspiration files'. Putting it all together, and expressing myself through words and pictures, has been a natural fit. I often feel as if I were made to blog! I have been blogging for almost 2 1/2 years; I was not one of the original design bloggers, but I was part of the second wave of design bloggers (Mrs. Blandings and Cote de Texas both started blogging around the same time as me). My email subscription list has been an important part of my blog, as I only post once a week or so. I have certainly had times when I have felt like no one was out there reading, but because of my email subscription list, I know that at least some people are reading! I tend to be an idea person, so coming up with ideas for posts is never a problem. Occasionally I will write a post that causes people to see things in a different way. 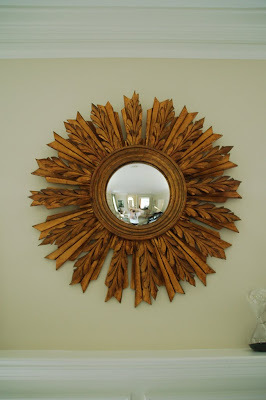 My 'light on two sides' post is one example of that - I had dozens of readers email me and say that I opened up their eyes to seeing rooms in a new light (literally and figuratively!). I have also had designers who comment that my perspective is unique and my observations have made them a better designer, because it has enabled them to see patterns that they had never noticed before. I feel so touched when a reader reaches out to me after a post that particularly speaks to them; one of the most touching emails I received was from a reader who recently lost her spouse and her beloved dog, and is now battling cancer. She emails me frequently and says that my blog is a little corner of beauty in her world, and she loves seeing my new posts because they lift her up and make her feel good. That is what I strive for in my blog - I try to always be positive, and create a beautiful little corner of the internet. What are your thoughts about design today? I think the design world is changing, based on what I am reading in newspapers and on the blogs. So many of the wonderful decor magazines are closing down, and I think this is a shame - I hope that bloggers are not contributing to the demise of the magazines, because blogs and shelter magazines are two very different, if related, mediums. Southern Accents is the magazine that I am going to miss the most. Southern Accents really reflected the design aesthetic of where I live, and many of the homes that were featured are on my daily route. I also think that magazines such as Southern Accents did a remarkable job highlighting up-and-coming design talent, and featuring products from the many furniture and lighting companies that are now struggling in this economy. Another thing that I have noticed is that design seems to be becoming a lot more like fashion - there seems to be a lot more disposable design. Maybe I feel this way because I am exposed to things every day on the blogs (in the past, it was just 2 or 3 magazines a month), but this is not the way that I want to approach the design of my own home. I don't want to decorate according to the trends - I want to decorate according to what I love, what I respond to. Recently Joni of Cote de Texas posted about New Orleans based designer Katie Stassi, and her words really resonated with me: Stassi strives to create environments, and create spaces that really touch the soul, sanctuaries, places that really reflects a person, places to relish 'all of the days of your life'. One of my all time favorite design books is 'Style' by Saladino. I am mesmerized by his style and timeless sophistication, his attention to architecture and landscape as an essential component of a great design plan. Blogging and reading other design blogs has really exposed me to so many wonderful designers and styles, and has helped me clarify what I really like in a home - whether it be a specific style or a general feeling that is achieved by the architecture and decor. My sister's designer, Jim Hawes of Caldwell-Beebe, is definitely one of my design icons. He transformed my sister's home (photo above) and it was one of the first times I walked into a home and was literally speechless. (I had seen the home before Jim worked his magic, and I truly could not believe it was the same place). 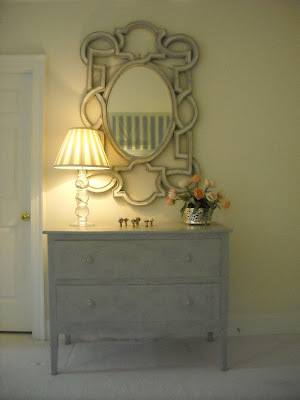 Jim's interiors really resonate with me, and through my sister and my blog, he has become a friend and a design mentor. I also love the work of Atlanta based designer Suzanne Kasler. There is something about her style that really speaks to me - she describes her approach in a home as composing a symphony, where there are notes that are repeated throughout a space. I immediately understood what Suzanne meant when I read this in her book. I think the most effective rooms (for me) are ones that use elements (often color and style) throughout the room in subtle ways - so you notice something different about the room every time you see it. I also think the most effective homes are the ones that have great flow and connection in both architecture and decor. This is not easy to achieve, and is not easy to describe in words, which is why I have such respect for the architects and designers who 'get it'. My favorite interiors from Suzanne's portfolio are sophisticated, but also have youthful and whimsical touches that make them fun. To me, decorating should be fun! The list can go on and on - but I must also mention Phoebe and Jim Howard. I have seen a lot of Phoebe's work, through her stores and her magnificent portfolio. Her interiors are fresh, light, classic and beautiful - and her store is my favorite decor store in the world. I have recently become more acquainted with Jim Howard's work. 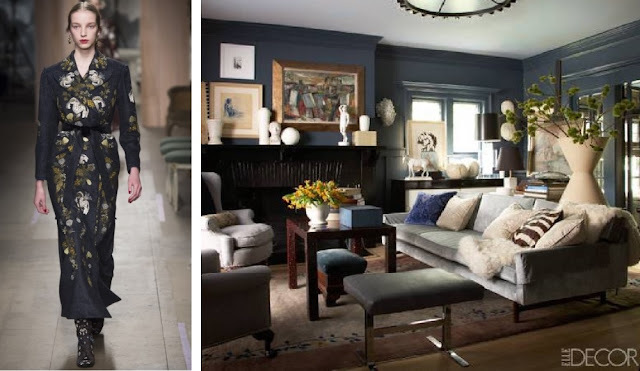 He does a lot of the interior architectural design in his stores (sometimes I go to the Max & Company in Atlanta to simply look at the beautiful antique terra cotta hexagon tile floor that he designed), but he is also a master at creating a nuanced interior. I can't help but think of Saladino when I see the interiors that Jim has designed recently - Jim really achieves such a beautiful layered effect that is truly timeless, with the amazing architectural details that are part of the design. If you read my blog, you can probably tell that I am not into fashion at all! My sister (who reminds me of Audrey Hepburn - she has an innate sense of style and is very chic) sometimes jokes that I am like 'Ugly Betty' - I have an awareness of what is in fashion, but I often don't quite know how to do it right. For this reason, I now go to a store where there are personal shoppers, and I put myself in their capable hands. I get a few great pieces every season, then supplement with the basics from the mall stores. I am hopeless with shoes - this is an area where I need some help! I need a stylist. OK - truthfully, nothing. I could toss everything out and start over without a single tear. I am just not into clothes and shoes! I only do about one post a week, sometimes two, and tend to work on my blog in the evening instead of watching tv. The rest of the time, I am volunteering for various organizations - primarily church and my kids' school - and taking art classes. Also, I try to walk my dog daily, and get a lot of ideas for my blog by walking thought some of the beautiful neighborhoods in Atlanta. I am also about to start a big project - designing and building a house (not by myself - with the help of an amazing team) - so that has started to take a lot of time with the various meetings with architects, designers, and builders. What was the last book you read or currently reading? I am in the middle of 'Best Friends Forever', by Jennifer Weiner. I love her books - she writes in the 'chick lit' genre, but it is so intelligently written. I also have the new Dan Brown novel on my bedside table. I just used an Amazon certificate I received for my birthday on a treasure trove of design books, which arrived this week. I am going to read 'The Private Home' by Rose Tarlow first. I love my bedroom. It is one of the few rooms in my house that reflects my personal style at this point in time. I have been slowly but surely making it over, and although it is not done (I stopped when we decided to build a house), I am really happy with how it looks. I am going to do a blog post on it very soon - but here is a little sneak peek . Your 4 most memorable posts of recent & why? One of my favorite posts from this year is 'Light on Two Sides'. It was inspired by a post I wrote on windows, and noted that I love it when a room has windows on two sides of the room. A reader emailed me and asked whether I had read the architectural book 'A Pattern Language', and said that light on two sides is a pattern that people seem to really love - a room with light sources on two sides often makes a person feel more comfortable in a room. 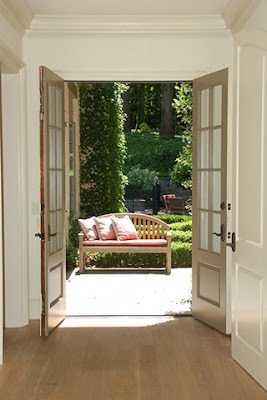 I immediately went through my files, and noticed that many of the rooms I love have light on two sides..
Later in the year, I wrote a post that was inspired by the blog of Atlanta landscape designer and author Tara Dillard, who frequently writes about the concept of 'vanishing threshold' where there is a thoughtful relationship between the interior and the exterior. 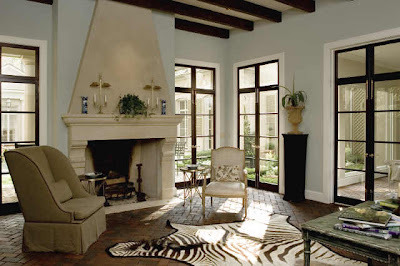 Another one of my favorite posts this year was on "steel windows" and doors. This is a feature that I have started to notice in a select group of beautifully designed Atlanta homes. Finally, one of my all time favorites, from last year, was on 'French floors' in a chevron and herringbone pattern. This is one of those posts that people have said that they always think of my blog when they see a chevron or herringbone floor, based on this post. Are there anything exciting projects you are working on you can share? I recently started a little online store with my neighbor, Quatrefoil Design. 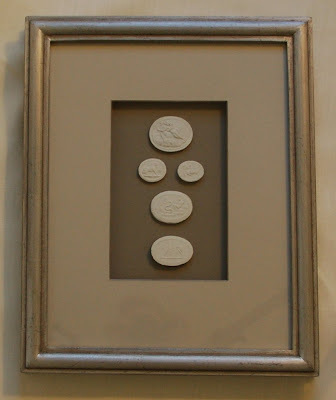 My neighbor and I found the most incredible person who creates framed intaglios, and we designed 22 unique intaglio patterns incorporating the reproduction intaglios that our source creates. It has been interesting to see the response since I posted about it a few weeks ago. We are learning so much from the clients that have emailed me. As a result of feedback from my readers and customers, we have created a new frame finish that we are calling 'gilver' - it is a silver with a warm gold glaze, so it is very versatile - it works in rooms that are both warm and cool toned. I have also been asked to write the home profiles for the Cathedral Tour of Homes, an annual tour of five homes that benefits the Cathedral of St. Phillips in Atlanta. The tour is a companion event to the premiere Cathedral Antique Show, The Tour of Homes takes place on January 24 and 25, 2010 - for those of you in Atlanta, mark your calendars! The homes this year are amazing (as they are every year) - I just started the process of interviewing the home owners, architects, builders, and interior designers involved in each home. All of the homes in the 2010 tour are renovations of classic Buckhead estates by some of the top architects, builders, and designers in town, and they all have their own unique story. It is such an honor and a privilege to be involved with this wonderful event. I am also beginning the process to design and build a home that will hopefully be my family's 'forever' home! I have lived in the same house since 1997, and it has served my family well. But, I have been looking for a home for years, and was not finding what I was looking for. This year, my husband and I made the decision to go ahead and work with an architect to design a house that will be perfectly suited to our needs. I know it is not going to be easy, but this is the most fun I have had in years! Lastly, How do you define happiness? ..In general, a feeling of contentment with what you have in life - to want what you have, not to pine away after what you don't have. Although I feature all sorts of beautiful spaces on my blog, I truly don't have a feeling that by acquiring things, I will be happy. This is a lesson that I am trying to teach my children, and I think it is important to model this behavior. However, I am not perfect! I will admit to desperately wanting a new house over the past 5 years - we have simply outgrown our current house, and it is on the other side of town from my kids' school. I have no illusion that a new house will make me a better or happier person, but I am looking forward to starting fresh, I must admit!.. To go a bit deeper, I think it is important to have true joy in your life - which is different than a fleeting feeling of happiness - and for me, true joy comes from a firm foundation of faith. My blog is not overtly about faith, however my faith is the foundation in my life and allows me to appreciate the beauty of God's handwriting in the every day, whether it is the amazing creativity and vision of an incredible artist, architect, or designer - or a beautiful room, a beautiful flower, the way a beam of sunlight shines in my front hall in the morning, the joy in my daughter's face when she spots me in carpool line. The list of things that inspire me is endless. So, without faith - I don't think I could write a blog like 'Things That Inspire', because I would not see the world in the same way. Please don't forget to leave a comment for our Wonderful Silk Floral Arrangement giveaway from Sophie Dahy Designs. UP to $300 Value! You pick the flowers you love ! !